Roberto Policastro (visual designer) and Walter Dipino (illustrator), the brainchildren of ‘Doppiavù’, founded their studio in 2000. They considered their idea as a natural evolution of an intense working career based on research, mere curiosity and constant overlooking for new communication languages. The work of the studio includes every single strategic activity necessary for a dynamic communication planning. The projects are synergically arranged with their clients: the counselling, analysis and research on visual and interactive languages, the creation and graphical projecting of communication coordinates, brand identity planning, the dealing of its contents, the creation of publishing projects, multimedia and event happenings, the development of new innovative solutions. Years of intensive client work on a national level, have built up an in-base expertise, which is shared with each client during every operational stage, to develop and constantly offer the best available means for marketing and communication problem solving. ‘Doppiavù’’s creativity has always been based on the principle of cooperation, experimentation and the blending of genres, which throughout the years and with fruitful interaction with various other work groups has created and organized a clockwork friendship union which can count on young professional complementary companies. 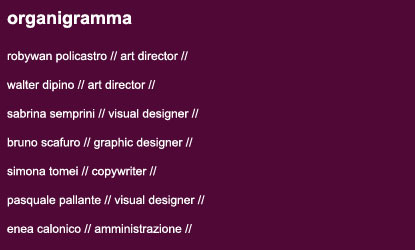 The studio works nationally from its head office based in Salerno and also from its representative office in Rome. The studio has an eclectic and constantly growing work team, which allows the ‘Doppiavù’ studio to realize communication and design plannings with absolute technical precision, creativity and passion, for private companies, and also for public institutions and boards.